Namely, when you find yourself in one, stop digging. He seems downright hurt that his constituents have been paying attention to the cynical machinations he has excelled in during his brief tenure in the House, and they remember what he said during the campaign. Now he is miffed that they want him to take a position on HB 645 – legislation that would allow concealed-carry on university campuses. He was especially steamed about a letter to the editor that ran in The Muleskinner, the student newspaper at CMSU UCM. He was so upset about it (text below) that he confronted the student in a public setting. Full disclosure: The student is a Democrat and he is also a politically active PoliSci major who is interning this semester/legislative session in Representative Mike Talboy’s office. Mike is my friend and my representative, and he is also the chief legislative election strategist for the House on the Democratic side. Mr. Wiseman is understandably perturbed himself, because Mr. Hoskins seems to think that he was “put up to” his letter by Representative Talboy. In fact, Mr. Wiseman asked Mr. Talboy if he would mind if he wrote the letter, and Mr. Talboy said “absolutely not” and offered to look it over if Mr. Wiseman wanted him to. After the letter was submitted, Mr. Wiseman told Mr. Talboy what he had written so Mr. Talboy would not be blindsided should Hoskins come after him. Thirty-two people lost their lives by the barrel of a gun at Virginia Tech April 16, 2007. Just over a year ago in a neighboring state, six college students were murdered by a gunman at Northern Illinois University. After such horrific examples of shootings on college campuses, certain members of the Missouri House of Representatives (including Rep. Denny Hoskins) think it’s a good idea to pass a conceal and carry law for Missouri universities. After these vicious acts that transpired, Rep. Hoskins wants to make it easier for such atrocities to occur in our state. Shouldn’t our representatives be more worried about limiting the amount of guns on college campuses rather than making it legal to conceal them? This is yet another example of Rep. Hoskins, and the members of his party, catering to organizations, such as the NRA, instead of protecting the citizens of Missouri from the dangers of guns. Rep. Hoskins may look at these recent shootings and claim the lives of the victims would have been saved if someone on campus would have had a gun. Multiple studies show the more guns are involved in a situation, the more deadly the outcome. More guns are not the solution to this problem, but the problem itself. Many would argue that citizens have the right under the Second Amendment to carry a gun on a campus. How does that correlate to forming a well regulated militia? These so called “protectors of the Constitution” that would defend the conceal and carry law on Missouri’s campuses should be forced to examine such barbaric acts of violence in which possession of a firearm was the cause. I ask that Rep. Hoskins reconsider his position on this bill, and for the citizens of this state to understand the shear destruction that propagates from firearms. Out of respect for those who have lost their lives in the Virginia Tech and Northern Illinois shootings, we owe it to them to reject this bill and to vocalize our opposition. Representative Hoskins was quite miffed by the audacity of the student to assemble facts and statistics and recall the campaign rhetoric and promises made by Hoskins (and maybe even this farcical attack against his opponent) during the race for the 121st legislative district. So miffed that he confronted the student. In public. In the student union. Contrary to some of the rumors that are floating around, he did not go to the student’s class and interrupt a lecture to deliver his rebuke. I was hanging out in the Union at UCM. Rep. Denny Hoskins was in there as well with a Muleskinner in his hand. He saw me from across the Union and walked over to me. He asked me where the Mulskinner office was, and I told him. He asked me if I wrote the article (knowing full well who I am and that I wrote it). I told him I did, and then he was visibly upset because I didn’t talk with him about the article before I wrote it. I told him that we could talk about it then and we discussed the topic. He was upset that I assumed his opinion on the bill and that he has never seen or heard of the bill. I told him that I assumed his opinion based off of his opinion on gun control and the conceal and carry laws. When I talked with him he even said he was in favor of conceal and carry laws, but he didn’t know how he felt about the bill because he hadn’t heard of it yet. I asked him to consider House bill 645, and to vote against it, and he said he would “look it over.” He was visibly irritated with my actions and he walked off to talk with the head of the communications department. That is pretty much what happened. I hope it helps. The thing is, Denny’s position is easy to assume. Asking him for a direct answer does not yield one. He knows what is being asked, and he knows that we know that he knows what is being asked, and he knows that we want an answer and there is only one reason he won’t commit…He want’s to play it both ways. That is, after all, this particular republican pony’s one and only trick, since we learned the CPA hates counting. I saw this first hand on Wednesday with my own eyes during the budget perfection debate on the House floor with Meals on Wheels. Lets just say I came away from watching that bit of political theater thinking that it would be splendid indeed if legislators could be required to put on a shock collar every time they stand up to speak, and the controls should be in the gallery. When they act like Hoskins and Pratt did on Budget-Perfection Wednesday – and I can only assume every other day – we should have the option of zapping them with a mild but unpleasant electrical shock. But Hoskins is no where near ready to stop digging and put down the shovel. I’m on the Faculty Senate of the University of Central Missouri. When I saw the letter in the school paper, I was concerned. This is legislation about my working conditions. Here is the email I sent Hoskins Thursday evening. A letter appeared in the Muleskinner today saying that you support HB 645 that would allow holders of a conceal and carry permit to bring their guns onto university campuses. Is the letter correct? Do you support this legislation? in to me your position on this legislation? On Friday afternoon, Hoskins called me at home. He told me that he had no position on allowing conceal and carry on public universities. He said before he would have to talk to students, faculty, and the administration. I told him that surprised me because universities about the learning and spreading of knowledge. Guns don’t help. Moreover, there is no evidence that a lot of guns make places safer. I noted if that were true Iraq, Afghanistan, Somalia, and Sudan should be some of the safest places in the world. Finally, I observed the groups he wants to talk to are not equal. Students are on a campus for at best five years. Faculty are on campuses for decades. This legislation is about our working conditions and I urged him to vote against ending the bill. He did not indicate what he would do. Now here is the thing…I am what passes for the resident gun nut in these parts. I am a hunter and a big, big fan of the Second Amendment. But I am not stupid or naive enough to think ordinary citizens could challenge our government in an armed rebellion. Those days are long gone, if for no other reason that the side with the Air Force always wins. Revolutions in this country take place via the power of the ballot, not the power of the bullet. Anyone who insists the latter is even possible is either stupid or crazy, and the two categories are not mutually exclusive. I am a country girl, a hunter and a deerslayer extraordinaire. I will never – let me repeat – never give up my guns. But I also didn’t stay out-state in the countryside. I spent a couple of decades cleaning up after gun violence on trauma teams in inner-city hospitals – I can’t begin to tell you how many nights I went home from work in the bloody Kansas City summer of 2004 with the blood of murder victims on my clothes, but I can tell you that on at least two occasions that summer, I picked gray matter out of my shoelaces afterwards. I am not someone you want to get your chickenhawk on with when this is the topic. Anyone who thinks that guns are too regulated is going to get stiff opposition a face full of claws scattershot from me. I also know something about contagious gunfire, and I do not think that allowing a bunch of young people who have not mastered impulse control the ‘right’ to carry a concealed weapon on campus is a good idea – and neither do the vast, overwhelming majority of law enforcement officials. More guns is not the answer to public safety. More guns means more violence. Now I am far from having all the answers, but I do know some of the right questions to ask, so to speak. I am convinced that if we are truly concerned with public safety, and not just pimping an ideology, we can do that and simultaneously strengthen the rights of law-abiding gun owners, but the ideologues don’t want to hear what I have to say about it because it runs counter to the opinion the NRA pays them to have. We all need a gut-check. We need to start by fully enforcing the laws on the books, but we also need to bring a basic framework of laws into standard compliance across all 50 states, with common sense adaptations. States need to share information. Thorough background checks for all firearms purchases should be mandatory, including psychiatric/psychological occurrences. I would go so far as to mandate that private sales, those currently unregulated, would have to take place through the county sheriffs office; and any unregistered sale proven in a court of law would carry a stiff penalty, with mandatory prison time. We can’t make guns go away. And I don’t want them to. But we can make it harder for criminals to get hold of new ones, and we can control the ones that are out there by actually enforcing the laws that are on the books right now and getting serious about bringing the ones that are currently floating around out there untraceable into the system one-by-one. My suggestions are not ideal, but it’s a place to start – until smarter people than me can get serious about this. Which will require standing up to the NRA – so I am not holding my breath. I have been watching Missouri politics very closely since 1991 when I was hired as director of a statewide grassroots anti-poverty organization. Changes made in the past few years have greatly damaged the quality of our state’s budget-making process. Traditionally the governor’s recommendations have been filed as budget bills. There are 13 budget bills, each dealing with a topic or department of government. For example, Budget Bill 2 is elementary and secondary education. Budget Bill 9 is corrections. Etc. The budget bills were traditionally assigned to the respective appropriation committees. These committees have generally be divided much as they are in 2009: agriculture and natural resources; education; general administration; health, mental health, and social services; public safety and corrections; and transportation and economic development. In the past, the appropriations committees would “mark up” the budget bills. The members of the appropriations committee could offer amendments to specific lines of the budget bill, and the committee would have the opportunity to vote on these amendments. Their versions of the bill contained actual numbers, and the amended budget bill they finally passed was sent to the budget committee. The budget committee could then make further amendments, but they started with the bills as amended by the appropriation committees. In recent years, with Allen Icet (R-Wildwood) as the Budget Chairman, the budget bills are not the governor’s recommendations. Instead they are generated by Rep. Icet’s office. They are not filed at the beginning of session and are not considered by the appropriations committees. This year we didn’t see a budget bill with real numbers until March. House bills (HBs) 2, 3, and 4 were not filed until March 2. HBs 6, 7, 8, 9 and 12 were filed on March 3. HB 5 was filed on March 4. HBs 10 and 11 were filed on March 5. The budget committee had testimony from each department of government on March 3, 4, 5, and 9. Only departmental staff testified; no members of the public were allowed to testify on any of the budget bills that were filed. For example, $2.5 million was the proposed cut for Meals on Wheels, a very effective program that provides both nutrition and human contact to senior citizens living at home alone. The bill containing Meals on Wheels was not filed until March 5. There was no public testimony permitted about the impact of that proposed cut, or any of the other propsed cuts or omissions. March 11 was the only day that budget members were allowed to offer amendments to the budget bills. This was a marathon session, lasting much of the day and long into the night. The process looked much like the floor process on the budget in that very few Democratic amendments were allowed to pass, but a small number of partial restorations were made. The Legislature then went on Spring Break upon adjournment on March 12. Break ended on March 23, and the Rules Committee (another bad government idea introduced in the Jetton Era) considered the budget bills that day and voted them out of committee. The House began perfecting the budget the next day (March 24th). Because the bills did not come out of Rules until March 23rd, the members did not receive copies in their mailboxes until the day we began perfecting the bills. Those of us not on the Budget committee were at a special disadvantage in the floor debate, because we had no time to consult agencies and programs affected by proposed budget cuts to assess the impact of the numbers in the budget. Because of the degradation of the budget process in the House, the Senate has increased its power over the budget in recent years. The Senate now rewrites the House bills, because they come out of such a flawed process and contain such bad decisions. In addition, when members of the public ask where and when they can testify about the impact of proposed cuts in the budget bills, the only available opportunity is in the Senate Budget committee. The Senate has better information about the contents of the actual budget bills because they have public hearings on those bills (bills with real numbers). To my knowledge, under this recently instituted system, the House versions of the budget bills are the only bills filed, assigned to committee, voted out of committee, and sent to the floor without opportunity for public testimony. The departmental Q & A sessions are helpful, but not an adequate substitute for hearing the voices of Missouri’s citizens. A ripple effect is that the Senate has much more knowledge and power in the conference committee work that comes after we have a passed House version and a passed Senate version. All of the Senate conferees, three majority and two minority party members, have participated in public hearings and lengthy consideration of the budget bills. State representatives are the closest contact any Missouri citizen has to state government. The elimination of a transparent and democratic budget process is a great loss to Missouri residents. Hopefully voters will demand a return to the old, fairer process in 2010. On the CWIP front, we may be about to lose a battle, but we’d have to be a sorry bunch of incompetents to lose the war. And we’re not that. The imminent battle is the vote on Monday of the Senate Commerce Committee. A month ago, the committee looked set to vote down Ameren’s money grab. Committee chairman Brad Lager, R-Savannah, said at the public hearing: “As is, I couldn’t even get this bill out of committee, much less out of the Senate.” A week later, I was part of a small group that lobbied Senator Tom Dempsey, R-St. Peters, to vote against the bill. He didn’t commit himself personally, but he did observe that the bill was unlikely to make it out of committee. Part of the reason it was floundering there was opposition from Kurt Schaefer, R-Columbia. As he questioned Ameren CEO, Tom Voss, and his colleague, Tom Burns [on the left], the freshman senator catalogued all “the serious flaws of this bill as it pertains to consumer protection”. And Ameren, fearful of getting singed by it, tried to get a federal judge to stop it from running during the NCAA Mizzou game. No dice, said the judge. It would be a prior restraint upon free speech and the ads contain information about an important public issue. I couldn’t say whether senators have started getting many calls about it yet, but I can say that if the legislature passes this crap, a ballot initiative for 2010 is sure to follow. And with the economy slumping along, voters are likely to vote again to ban CWIP by an even larger margin this time than the original vote in 1976. Here’s an indicator of the truth of that claim: AARP did a robocall questionnaire on the issue last Monday and got three times the response they would normally expect from such an operation. Republicans would be foolish to enact this legislation. Charlie Shields may think he can afford it. He’s from St. Joe, where people don’t even know what AmerenUE is, and he may figure that his constituents won’t cotton onto the fact that SB 228 is going to be picking their pockets sometime down the road. But once this issue hits the state ballot, Missouri voters are going to find out what a piece of garbage the legislature passed. Republicans–and Democrats–who have voted for it may find themselves scrambling to avoid being on the wrong end of the electorate’s pitchfork. Starting Monday, St. Louis’ mass transit system will reduce service radically. The service area for this multibillion-dollar regional asset will shrink by two thirds, literally overnight. The Metro transit agency faces an operating deficit of $45 million this year, which is expected to reach $50 million next year. Nearly one in every four of its 2,300 employees will be laid off in the coming weeks. Many highly skilled and productive employees already are being poached by transit systems in other regions. Service will end at 2,300 of the 9,000 bus stops and shelters on Missouri’s side of the system; service in Illinois, which is fully funded, won’t be affected. A bus fleet of 320 will shrink to about 140. MetroLink light rail riders will see one-third fewer trains during rush hour. Call-A-Ride service for the disabled will be slashed. St. Louis gets very little state money for our transit system, while Illinois funds mass transit very well even in southern Illinois just across the river. It’s worth noting that this isn’t just the fault of the Republicans, though they certainly share the blame. Governor Nixon has shown very little interest in increasing transit funding for St. Louis. Be it known that the (unlucky) thirteen liaisons in the governor’s office are actual people, with mortgages and, in some cases, children to support. Chris Pieper, a lawyer and the son of veteran political activist in St. Peters, Cheryl Hibbeler, finds himself fired as of July 1st. Pieper left a job at Thompson, Coburn for a salary that is not much more than a third of what he had been earning because–his mama raised him right!–he wants to work in public service. Like Chris, Crystal Lovett-Tibbs left a good-paying job at Husch and Eppenberger. And I’ll bet if I had time to investigate the other eleven on the chopping block, I’d find similar stories of people willing to sacrifice because of their commitment to public service. Republicans would respond: Oh, come off it! We all know the Senate will restore the funds to pay the liaisons. And subsidize your cynical little game? Yes, we hope they will. But in the meantime, Icet’s army is toying with people’s livelihoods. And I suspect that, considering the uncertainty the liaisons are currently facing, it will be insufficient comfort for them to know that they are helping re-elect Denny Hoskins and Scott Largent. This seems kind of important. FBI agents are investigating Missouri lawmakers in connection with several alleged “pay for play” schemes in which legislative favors are bestowed only after campaign donations are made. The political culture in the state Capitol, those lawmakers talking with agents contend, has become tainted by pay-for-play activities in which virtually any legislative benefit – from committee assignments to gaining a hearing for a bill – comes with a price tag attached. While I typically focus on Senate races, the special election in New York’s 20th Congressional district is an excellent opportunity to stick it to the Republican Party. NY-20 is a Republican leaning district in voter registration, but has been recently represented by now-Senator Kirsten Gillibrand and even narrowly supported now-President Barack Obama over John McCain. The Democratic nominee, Scott Murphy, has turned a deficit in the polls into a narrow four-point lead over Republican Jim Tedisco. Momentum is on our side! A victory in this special election wouldn’t just be a nice Democratic hold, but, since it is a Republican-leaning district, it would also be a major embarrassment for Republicans, particularly new RNC Chair Michael Steele. The special election is this Tuesday! So what can you do to help? Phone bank for Scott Murphy! This is a special election, so GOTV is everything. On Monday or Tuesday, if you can spend literally one single hour making calls, that could be the difference in a Republican pick-up versus a Republican embarrassment. Committee chair Thomas Minihan from Jefferson City conducting the business portion of the meeting. The 4th Congressional District Democratic Committee, made up of county Democratic Party chairs and vice chairs and Democratic Party legislative district committee chairs and vice chairs, met in Sedalia mid-day today. These meetings, scheduled at least four times a year, are an important part of the communication process for Democratic Party activists in the district. Thirty individuals from across the district made it to Sedalia through somewhat unseasonable winter weather. 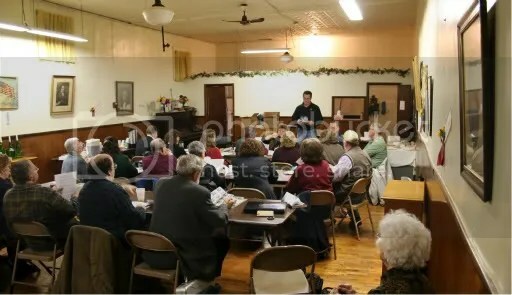 The agenda included informational items as well as some decision making for a large scale event scheduled for early August in Warsaw, Missouri. 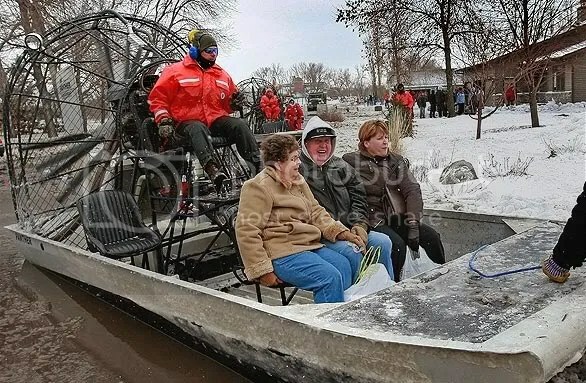 As the residents of North Dakota face unprecedented flooding along the Red River, Governor Nixon is sending two Missouri National Guard units to help our neighbors to the north. He ordered fourteen Airmen and two C-130s from St Joe and twenty members of a helicopter maintenance crew from Springfield activated today. The helo crew will report to Grand Forks today and the C-130 crews are awaiting orders . 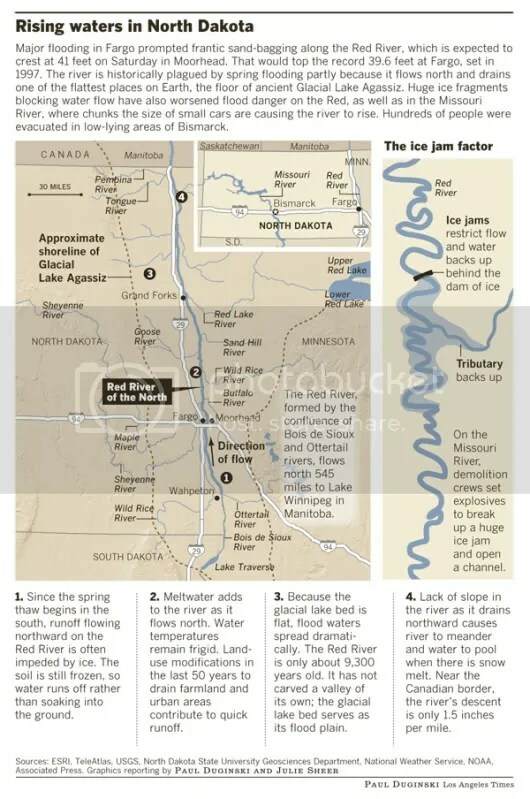 The Red River along the Minnesota-North Dakota state line is more than twenty feet above flood stage, and is expected to crest well above the previous record of 40.1 feet, that was set in 1897. 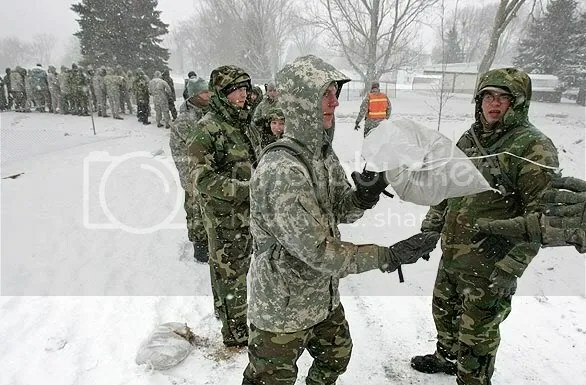 Kudos to Governor Nixon and Adjutant General Stephen Danner for responding to a neighbor in need promptly and efficiently, sending along highly trained Guardsmen who can fill a specific need and actually be helpful, versus just in the way. (You get an effective commander who gives wise counsel to the Commander in Chief of the state’s Guard forces when that man with the Stars on his shoulders came up through the ranks and remembers that he was once a lowly grunt himself.) This deployment decision just confirms my assertion that Danner was the best man for the job back when the appointment was announced and my heart commenced to sing. Every time the north-flowing Red River jumps it’s banks, the residents of the area get better and better at dealing with it and keeping the waters at bay. The “invisible flood walls” that assemble quickly, then break down for storage are an ingenious flood-prevention scheme. My hat is off to the person who dreamed that one up. It’s bloody brilliant! 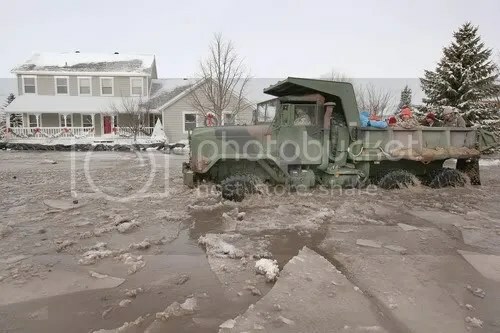 A deep-water guard truck rolls through a neighborhood that is losing ground to the water. 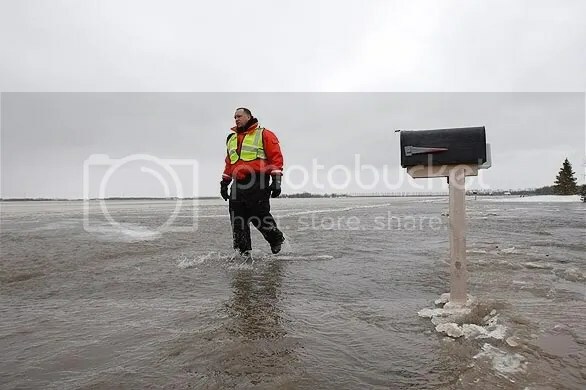 A lone rescuer wades through the icy waters of the Red River, going door-to-door telling residents to evacuate. Where there is water and peril, you will find the Coast Guard – the one branch of service that no one in my family has any connection to, unfortunately. 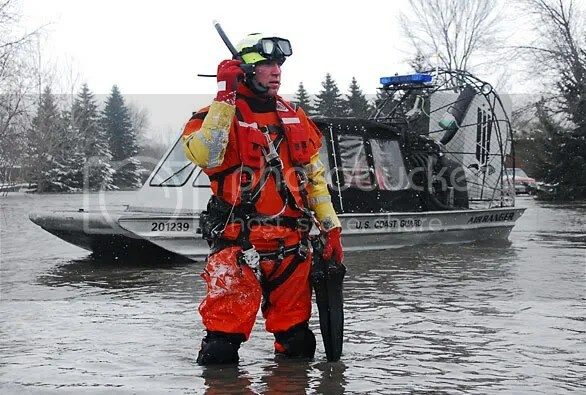 Water Rescue – or – why you should probably comply when it is suggested that you evacuate. Hats off to all the rescue personnel, and warm dry wishes to all the residents of the area. Let us know if there is anything else we can do. For instance, if anyone is in the area, or has friends or family there, and knows of community-level organizations that are taking donations and helping those affected directly, either leave links in comments or email them to us.